Sporobolus stapfianus is a perennial caespitose, C4 grass, largely found in dry savannahs. Photo from Flora of Zambia. Sporobolus stapfianus is a member of one of the largest and most important plant families, the Poaceae, but, alas, as Gaff et al. have put it, it is “obscure”.1 Despite not having a large devoted fan club, it is widely distributed in dry savannahs in central/eastern and southern Africa, Nigeria and Yemen at elevations from ca. 90 to 1700 m ASL.2 Most of the specific ecological information regarding it concerns its role as a forage species and as a component of the savannah and woodland communities, especially in Uganda. In a survey of grazing by wild animals conducted Queen Elizabeth National Park (southwest Uganda) in the mid-1950s, for example, S. stapfianus was found throughout the park, from areas considered lightly grazed, to moderately overgrazed to seriously overgrazed, with highest representation in the moderately overgrazed zone. There, it represented 19% of the total range vegetation in the wet season, and over 45% at the end of the dry season.3 This may reflect its resilience, or it may reflect that it is not especially appreciated by herbivores. The latter is suggested by results of studies in northeast Uganda around cattle watering holes.4There, species composition and plant size were affected by distance from a watering hole itself. More desirable species increase in vitality with greater distance (indicating that grazing pressure is heavier close-in) while less desirable species decrease in vitality with distance, meaning, perhaps, that they can’t compete with other grasses in the absence of heavier grazing. 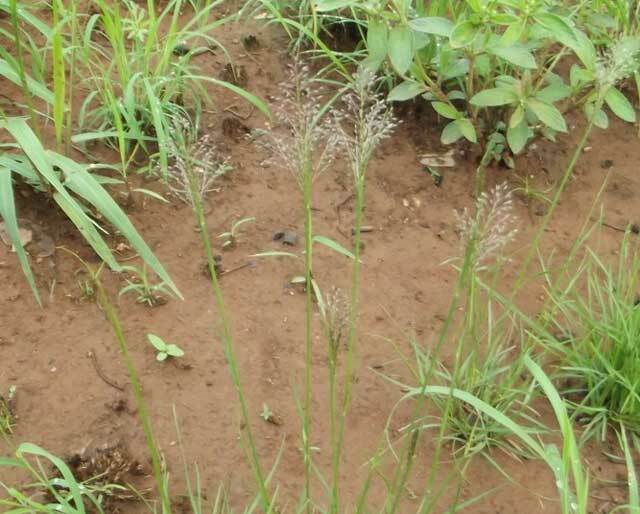 Sporobolus stapfianus is in the latter group. Fully hydrated leaf of S. stapfianus. The section shows large bulliform cells and C4-Kranz anatomy. From Vecchia et al. 1998.8 Used by permission of the author. Leaf morphology and responses to dehydration – Sporobolus stapfianus leaves are fairly typical of C4 xerophytic grasses, including thick walled epidermal cells, especially on the abaxial surface, large bulliform cells and Kranz anatomy.8 The bulliform cells represent a substantial fraction of the leaf volume and may slow down drying by releasing water to other cells. In resurrection species, this could increase the time available to activate protective mechanisms and prevent drought damage. The dehydrating leaf. (5a) A fresh section of a S. stapfianus leaf after a week of dehydration. The bulliform cells are still nearly round, and the leaf edge is only slightly curved (bar = 200 µm). (5b) After 3 weeks, some bulliform cells have shrunk, the curvature of the leaf edges is more pronounced, and the lamina is more folded (bar = 500 µm). From Vecchia et al. 1998.8 Used by permission of the author. At least two studies have examined changes in metabolites during dehydration2 and rehydration6 in S. stapfianus. Both of those are studies are extensive and impressive, and the summary here hardly does them justice. Go read them. In the fully hydrated state, in comparison with a closely related and co-occurring sister species, S. pyramidalis, S. stapfianus had higher concentrations of osmolytes, lower concentrations of metabolites associated with energy metabolism, and higher concentrations of nitrogen metabolites. Because of the roles such compounds play in dehydrated tissue, this result suggests that S. stapfianus is primed metabolically for the stress. (Priming has been noted in a number of stress tolerant species for a number of stresses). With dehydration to a leaf RWC to 60%, S. stapfianus shifted toward the production of protective compounds (putative cellular osmolytes, including several amino acids, a number of sugars and sugar alcohols, and antioxidants). For the most part, concentrations of the same compounds in S. pyramidalis remained unchanged. At RWC lower than 40%, the S. stapfianus leaf metabolome was strongly directed toward antioxidant production, nitrogen remobilization, ammonia detoxification, and soluble sugar (sucrose) production.2 S. pyramidalis was, alas, no longer with us by that point. Sucrose accumulation during dehydration would, on the face of it, be a potentially major energy source for the reactivation of metabolism during rehydration. During the rehydration process, energy must be provided for restoration of metabolic activity and repair of desiccation-induced damage, and respiration is rapidly reactivated following watering. The role of sucrose in this is unclear, however, because its breakdown is not apparent in the initial phase of rehydration.6 Later, however, when sucrose levels do fall, the concentrations of hexoses (glucose and fructose) remain unchanged, suggesting that at that point, sucrose is indeed a major energy source. In the dehydrated state, S. stapfianus also seems to be primed to reactivate metabolism. For example, hexokinase activity at the start of rehydration was 4.5-fold higher than that in the fully hydrated controls, having been unregulated during dehydration. Phosphofructokinase (PFK) showed a similar pattern. Both activities remained high during 10-d of rehydration. Respiration also increased immediately on rewatering and before there was significant sucrose breakdown. The levels of malate dehydrogenase (MDH) and glutamate dehydrogenase (GDH) were high enough that the use of amino acids as respiratory substrates would apparently allow this. A special note about proline – Reports of the accumulation of proline with water stress go back well into the 1960s, and despite the widespread tendency to assay this one amino acid in drought or salt experiments, its direct relationship with stress tolerance actually is more than a little questionable. Studies with S. stapfianus are a good lesson in this regard. Unlike other species dealt with on this site until now, S. stapfianus has a much larger genome (haploid=1.3Gb) and it is tetraploid rather than diploid. As a result of this additional complexity, there is as yet no sequencing project or genome assembly for the species. Excluding chloroplast genes (e.g. rbcL), internal transcribed spacers and patents, GenBank currently contains only 25 nucleotide sequences for S. stapfianus. All are for genes whose expression is markedly affected by desiccation, and all are from Le et al.14 or Neale et al.15Following that link will give the latest results whenever more are added. In addition, there are two BioProjects from a transcriptome shotgun assembly using 454 sequencing. Those results have been published.12 Following that link will also give any additional projects as they appear. This page was put composed by John Cheeseman who is grateful for the correspondence, discussions and assistance of Mel Oliver, Don Gaff and Concetta Vazanna. Additions, corrections and suggestions are welcome. Sporobolus stapfianus appears as the major focus of only a few articles indexed in PubMed although it is much more broadly represented in articles dealing with DT in general. The following is a partial list of publications from that collection, focussed on studies emphasizing a molecular aspect. The list was generated by a search of PubMed; additional publications not indexed in PubMed are, of course, not included. Abstracts and/or full text versions can be accessed by clicking doi, PMID or PMC numbers. For a list of all PubMedCentral (PMC) listed publications including S. stapfianus, click here. Yobi, A, Batushansky, A, Oliver, MJ, Angelovici, R (2019) Adaptive responses of amino acid metabolism to the combination of desiccation and low nitrogen availability in Sporobolus stapfianus. Planta 249:1535-1549. doi: 10.1007/s00425-019-03105-6. PubMed PMID:30725176 . Yobi, A, Schlauch, KA, Tillett, RL, Yim, WC, Espinoza, C, Wone, BW et al. (2017) Sporobolus stapfianus: Insights into desiccation tolerance in the resurrection grasses from linking transcriptomics to metabolomics. BMC Plant Biol. 17:67. doi: 10.1186/s12870-017-1013-7. PubMed PMID:28351347 PubMed Central PMC5371216. Griffiths, CA, Gaff, DF, Neale, AD (2014) Drying without senescence in resurrection plants. Front Plant Sci 5:36. doi: 10.3389/fpls.2014.00036. PubMed PMID:24575108 PubMed Central PMC3922084. Islam, S, Griffiths, CA, Blomstedt, CK, Le, TN, Gaff, DF, Hamill, JD et al. (2013) Increased biomass, seed yield and stress tolerance is conferred in Arabidopsis by a novel enzyme from the resurrection grass Sporobolus stapfianus that glycosylates the strigolactone analogue GR24. PLoS ONE 8:e80035. doi: 10.1371/journal.pone.0080035. PubMed PMID:24224034 PubMed Central PMC3818285. Oliver, MJ, Guo, L, Alexander, DC, Ryals, JA, Wone, BW, Cushman, JC et al. (2011) A sister group contrast using untargeted global metabolomic analysis delineates the biochemical regulation underlying desiccation tolerance in Sporobolus stapfianus. Plant Cell 23:1231-48. doi: 10.1105/tpc.110.082800. PubMed PMID:21467579 PubMed Central PMC3101564. Oliver, MJ, Jain, R, Balbuena, TS, Agrawal, G, Gasulla, F, Thelen, JJ et al. (2011) Proteome analysis of leaves of the desiccation-tolerant grass, Sporobolus stapfianus, in response to dehydration. Phytochemistry 72:1273-84. doi: 10.1016/j.phytochem.2010.10.020. PubMed PMID:21109273 . Li, FH, Fu, FL, Sha, LN, Li, WC (2007) Identification of drought-responsive genes from maize inbred lines. Zhi Wu Sheng Li Yu Fen Zi Sheng Wu Xue Xue Bao 33:607-11. . PubMed PMID:18349516 . Whittaker, A, Martinelli, T, Farrant, JM, Bochicchio, A, Vazzana, C (2007) Sucrose phosphate synthase activity and the co-ordination of carbon partitioning during sucrose and amino acid accumulation in desiccation-tolerant leaf material of the C4 resurrection plant Sporobolus stapfianus during dehydration. J. Exp. Bot. 58:3775-87. doi: 10.1093/jxb/erm228. PubMed PMID:18057046 . Martinelli, T, Whittaker, A, Masclaux-Daubresse, C, Farrant, JM, Brilli, F, Loreto, F et al. (2007) Evidence for the presence of photorespiration in desiccation-sensitive leaves of the C4 'resurrection' plant Sporobolus stapfianus during dehydration stress. J. Exp. Bot. 58:3929-39. doi: 10.1093/jxb/erm247. PubMed PMID:18037680 . Martinelli, T, Whittaker, A, Bochicchio, A, Vazzana, C, Suzuki, A, Masclaux-Daubresse, C et al. (2007) Amino acid pattern and glutamate metabolism during dehydration stress in the 'resurrection' plant Sporobolus stapfianus: a comparison between desiccation-sensitive and desiccation-tolerant leaves. J. Exp. Bot. 58:3037-46. doi: 10.1093/jxb/erm161. PubMed PMID:17901195 . Martinelli, T (2008) In situ localization of glucose and sucrose in dehydrating leaves of Sporobolus stapfianus. J. Plant Physiol. 165:580-7. doi: 10.1016/j.jplph.2007.01.019. PubMed PMID:17765358 . Whittaker, A, Bochicchio, A, Vazzana, C, Lindsey, G, Farrant, J (2001) Changes in leaf hexokinase activity and metabolite levels in response to drying in the desiccation-tolerant species Sporobolus stapfianus and Xerophyta viscosa. J. Exp. Bot. 52:961-9. . PubMed PMID:11432913 . O'Mahony, PJ, Oliver, MJ (1999) The involvement of ubiquitin in vegetative desiccation tolerance. Plant Mol. Biol. 41:657-67. . PubMed PMID:10645725 . O'Mahony, PJ, Oliver, MJ (1999) Characterization of a desiccation-responsive small GTP-binding protein (Rab2) from the desiccation-tolerant grass Sporobolus stapfianus. Plant Mol. Biol. 39:809-21. . PubMed PMID:10350094 . Clugston, SL, Daub, E, Honek, JF (1998) Identification of glyoxalase I sequences in Brassica oleracea and Sporobolus stapfianus: evidence for gene duplication events. J. Mol. Evol. 47:230-4. . PubMed PMID:9694672 . Wood, JN, Gaff, DF (1989) Salinity studies with drought-resistant species of Sporobolus. Oecologia 78:559-564. doi: 10.1007/BF00378748. PubMed PMID:28312187 . Vecchia FD, El Asmar T, Calamassi R, Rascio N, Vazzana C. Morphological and ultrastructural aspects of dehydration and rehydration in leaves of Sporobolus stapfianus. Plant Growth Regulation. 1998;24:219-228. Tymms MJ, Gaff DF. Proline accumulation during water stress in resurrection plants. Journal of Experimental Botany. 1979;30:165-168. Gaff DR, McGregor GR. The Effect of Dehydration and Rehydration on the Nitrogen Content of Various Fractions from Resurrection Plants. Biologia Plantarum (Praha). 1979;21:92-99.